Accra, November 11, 2012 We’re pleased to announce that Apps4Africa will be returning to Ghana for the third consecutive year, with the new theme “Business Challenge.” Join us on December 1st at the Kofi Annan Center of Excellence (KACE-AITI), from 10.00am for the brainstorming event to discuss and develop potential submissions. Register at Eventbrite. Apps4Africa 2012: Business Challenge builds on the success of the two previous Apps4Africa competitions. In 2010, Apps4Africa focused on Civic Challenge and spurred developers to find innovative technology solutions to everyday problems on issues ranging from transparency and governance to health and education. The winning app – iCow – was developed in Kenya and enables farmers to better manage the breeding periods of their cows, helping increase yields. Regional winners of the 2011 Apps4africa competition on Climate Challenges in Africa came from Nigeria, Tanzania, Ghana, Senegal, Kenya and Botswana and produced apps that promote food security, health, sustainable agricultural practices, and disease monitoring. Remember Ghana’s 2011 winner, Farmeronline.org? The team will be on hand to share their experience and if they are not too modest maybe they’ll share how they went on to win the World Summit Youth Award. 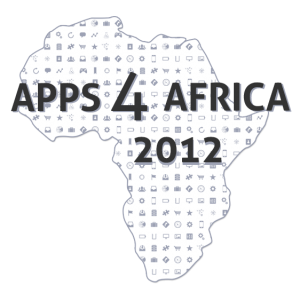 This year’s Apps4Africa 2012: Business Challenge launched at DEMO Africa on October 25-26, 2012 in Kenya- Nairobi. DEMO Africa is a technology and investor forum geared towards identifying leading innovators and supporting fast-growing technology startups. After the launch in Nairobi- Kenya, a series of Apps4Africa brainstorming sessions will be held across Africa starting from: Uganda, Zimbabwe, Democratic Republic of Congo, Nigeria, Ghana, Zambia and Senegal to debate and discuss openly the Business challenges facing the Youth, the entrepreneurs and technologists. The winners of this year competition will receive prizes, mentorship and seed capital to help them start and take their Businesses forward. Appfrica International is an organization focused on three drivers of change for Africa’s knowledge economy: mentoring young technologists, investing in their ideas with time, attention, and capital, and highlighting their successes across the continent. Appfrica International, with the support of the U.S. Department of State and the World Bank, will bring together civil society, academia, and the private sector to support African technology innovators in creating apps that promote economic opportunity and entrepreneurship in Africa through the Apps4Africa 2012 Competition. Apps4Africa 2012 competition partners include TED, The Unreasonable Institute, iHub, IDEO, and LIONS@AFRICA, a public-private alliance led by the U.S. Department of State’s Office of Global Partnership that fosters public-private partnerships promoting technology and innovation in Africa. Appfrica International has renewed its partnership with Senegalese Born Marieme Jamme, CEO of Spotone Global Solutions to bring again engaged, localized and energized brainstorming sessions across Africa.